One of my 8th grade students has significant difficulty regulating his emotions, more than other students at the school anyway. Thankfully, this is a student who receives special education services and who attends an alternative school, yet, his behavior even stretches our abilities to effectively work with him sometimes. This is the start of his third year at our school, so his pattern of behavior is quite well-known and predictable now. We also have been trained in complex trauma (there is lots of information here) so we are better at addressing the behavior. This student comes to school every day and is able to start each day being appropriately social with peers and staff. During our morning meeting (where we use the Responsive Classroom model) he is an active participant and has a positive attitude. But anything unpredictable or unstructured can trigger him; he has even told staff (when he is calm) that his thoughts can intrude and trigger him. Once he is triggered, he begins his downward spiral. What he shows outwardly at first is loud sighing or groaning about the school work or the class expectations, or he might start calling himself stupid because a task is hard for him. Then he will yell at peers (even though they are using normal voice tones to ask questions and complete their work) to quiet down because he can’t concentrate, and when they respond to him, it’s to tell him to quiet down. This causes him to lash out with threats and name calling (which might then trigger trauma responses from them, and then everyone escalates). His language becomes inappropriate for school. Then he becomes extremely oppositional, refusing to leave the room to regulate, continuing to openly challenge students, roaming the hallway, calling people names. When he finally gets into a separate space long enough to work with someone to regulate, it takes quite some time for him to get to a point where he can return to class and meet expectations. Sometimes he walks out of the school building and goes home before the end of the school day; other times he is able to make it to the end of the school day even though he didn’t complete much work in any of his classes. When he is on task and participating in class he is focused and can ignore little distractions in order to complete his work. Sometimes this focus will last all through the morning and into the afternoon; sometimes it lasts only for a few minutes of a class. Sometimes his oppositional behavior lasts through consecutive class periods; sometimes he goes through this behavior cycle within the span of one class period. This behavior in a mainstream school would end up getting him sent out of the classroom or suspended; he would also probably be referred for a risk assessment. Staff usually intervene once he begins his loud sighing or groaning, but there are many factors throughout the day that can affect how quickly we teachers respond to this student: we may be helping other students with their school work; we may be helping other students regulate their own behavior and work through their issues; we may be introducing a lesson and giving instructions. Model respectful, non-violent behavior and relationships. Provide many genuine choices to increase sense of self-efficacy and self-control. Be clear about expected behaviors; teach rules and expected behaviors explicitly. Remember, repetition is key. Children who have experienced complex trauma will likely take longer to generalize a skill than their peers. Avoid using words when a child is disregulated. Consider walking, rocking, etc. as an intervention until the student is regulated. Develop a system for consequences that is not punitive. Consequences should be logical and designed to teach, not punish. Avoid power struggles. If behavior is a consistent problem, consider having a functional behavior assessment conducted to determine triggers and develop a behavior intervention plan. There is a lot of information here about this type of behavior and how to respond; it’s not information that most teachers readily have because it’s not something that they usually need. I am a special education teacher working in an alternative school, so this information has helped me do my job better. I share it because it is useful to know, and it can help all teachers decode the meaning behind some outrageous behaviors they see (no matter how rare they might be in a mainstream setting). As a teacher of students with significant emotional and behavioral challenges, I’ve found that it is imperative to form good working relationships with the parents of my students. As part of our alternative school program, parents meet every two weeks with the special education “team.” We call these meetings “home conferences;” it doesn’t mean that we meet with the parents at home–it just means that we have a home-school meeting with all the players on the student’s team. The best thing you can do to work with parents of tough kids is to remember that they might not have the same values as you do. Some of the parents I have worked with over the years are people who aren’t necessarily people I think are the best role models, but I look beyond that and understand that they are doing the best they can with the resources they have. Listen to them; let them download their worries to you, and be someone they can lean on. Don’t try to make them fit into a middle class mold. Shake their hand when you meet them, smile at them warmly, and ask them about themselves. Their child might be difficult in the classroom, and you need the parents on your side. Set up regular meetings that are based on all of the good things the student has accomplished. These meetings might only be 10-15 minutes long, but you will quickly become well-liked when you are sharing positives about their child in person. Parents of your difficult students have often had difficulties back when they were in school, so school is a negative and scary place to be. When you communicate positive accomplishments, the parents aren’t as afraid of school personnel. You will need to have at least 40 positive communications “in the bank” with a tough kid before you have a negative communication with that child; otherwise it will be an uphill climb to build a relationship with that student and to have them trust you. The same can be said for working with a parent of a tough kid; build up the positives so that when things get difficult and you have to give some negative feedback, the parent trusts you. Relationship is key. In order to work best with a tough kid, you have to build a solid relationship with them because you will be relying on that when their behavior gets difficult. A tough kid is not going to follow your directions and listen to you because you are the “authority.” You have to show that kid that you can be trusted. You have to be a safe person for the tough kids. In the classroom, tell the child, “thank you for (insert compliment),” or “I like how you (insert compliment).” Be specific with your feedback, so that it shapes the positive behavior you want. Try to ignore minor attention seeking behaviors. Likewise, if you are a principal who only sees your students occasionally or when they have been “bad,” then you aren’t going to garner respect from the tough students. Stand in the hall in the morning and greet each student as he or she enters the building; go to student homerooms to say hello, or talk to them while they eat breakfast (or eat with them). If you work in an alternative school, this is even more important. Go into classrooms and compliment students who are on task and show interest in their work and accomplishments. I don’t know how many times since we’ve gotten our new principal that the students will ask where she is, or they will comment on the fact that she only comes into a classroom when someone is in trouble. Students notice, and teachers can’t hide it. Further, if you are a principal of tough kids, go to the positive parent-teacher meetings and be a presence in the room when there is good news; if you only go to the meetings where there is “bad news,” again, you aren’t going to build any trust with the parents or the students. A case in point: our principal doesn’t go to many parent-teacher meetings; I’ve had parents in the spring of the school year who never remember meeting the principal; I’ve also had parents say to me that they don’t want her at a meeting because they don’t trust her. Because she’s an authority figure in the school, they especially don’t trust her; they see her just like they’ve seen all authority figures in the past: not on their side. No matter what type of school you work in, and no matter what type of principal you have, you need to build the strongest relationships with your toughest students and their parents. Those are the people who need to know that you are a safe person who is on their side so that when times get tough, they can trust that you have the best interest of their child at heart. The students I work with have significant emotional and behavioral challenges. At our school, the staff has been getting training in being a trauma-informed learning environment. Our local mental health service providers have worked with us and been a good resource for us in this endeavor. We also were given a good web resource with tons of information about how mental illness affects kids, and how it looks in the classroom. Further, there is an entire resource on complex trauma; those are the kinds of kids that I work with daily. Now that I can see behavior through a trauma “lens,” it helps me remember that behavior is a message, and I need to figure out what the behavior is telling me. Complex trauma is when children are exposed to a traumatic event multiple times; this is different than a one time traumatic event which may cause Post-traumatic Stress Disorder (PTSD). Complex trauma means that a child has been exposed repeatedly, over time, and some of these events include: neglect, bullying, physical and sexual abuse, chronic mental or physical illness, chronic family fighting, an incarcerated parent, the effects of poverty, homelessness, and maternal stress during pregnancy. The effects of complex trauma on the brain are staggering. There can be attachment problems; that means that these children can have a hard time making and keeping friends, or they can have a hard time with social boundaries and cues. There can be self-regulation problems; this means that they can have a hard time managing emotions, or they can have problems knowing when they are hungry or full, or they have difficulty self-soothing and controlling their impulsivity. There also can be problems with their competency which means they may have difficulty planning and organizing; they can have a lack of an ability to problem-solve, difficulty processing language, or they may have low self-esteem. The Students First Project has listed many of the most difficult behaviors that students exhibit, with links to information and strategies for your classroom. Becoming “trauma-informed” has really helped my teaching practice because I’ve been more patient and understanding with students. Even if you don’t work with students with complex trauma, you probably have students with ADHD, depression, anxiety, or one of the many other issues that affect children and make it difficult for them to achieve their best in the classroom. Today I worked on another diversity lesson with my students. We’ve been talking about push factors and why people might leave their home countries. 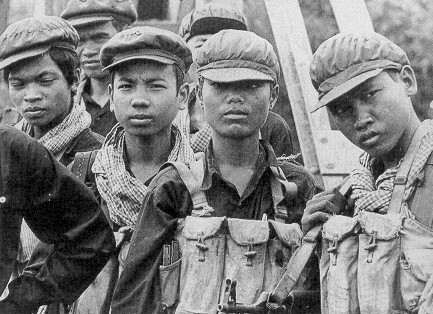 This time we did a study of the Khmer Rouge regime in Cambodia. I presented students with a slideshow of various images from the Khmer Rouge. Students (and these were 10-11th graders) were asked to write down the words that came to mind as they viewed the various images. They saw images of torture victims, demolished city structures, mass graves and other images that provided insight into the genocide that happened from 1975-1978. Words that students used included: Grimm, death, torture, devastation, annihilation, struggle, starvation, and discrimination. I was really proud of the empathy they showed toward the Cambodian people and the frustration they showed at the denial by the leaders of the regime. We then read an article from 2007 when some of the leaders had finally been arrested. We answered some questions and discussed it. I heard a lot of frustration about how long the leaders got to live without being held accountable for the atrocities they committed. I also had students ask me about how the United States responded to the leaders of the regime at that time. I even had students ask if some of the Asian population of refugees in our city are from that time…yes. I had students literally express to me that they had no idea that was why people had left their homeland and moved here. I am really proud of my students and I’m hoping the engagement in this topic continues.